Navigation Rules: International and Inland is the source material for one of the toughest of the captains' and merchant mariners' exams administered by the US Coast Guard. Sections relevant to test takers are read in this abridged version of that guide. 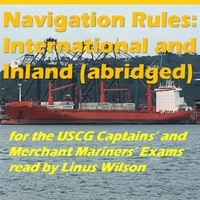 The relevant sections of Navigation Rules: International and Inland are read in this album. This abridged reading covers both the COLREGS and inland navigation rules. This publication is the source material for the U.S. Coast Guard's captains' and merchant mariners' Rules of the Road exams. Rules of the Road is one of the toughest exams administered by the USCG. Listening to the text of Navigation Rules is a great way to prepare for those exams regardless of whether you have paid for an expensive course or you are attempting self study. You must get at least 90 percent of the Rules of the Road questions right to earn a OUPV ("six pack") or 100 ton masters ticket. The only way to do well is to know the Navigation Rules: International and Inland very well. The sections relevant to test takers are read and discussed.